No Smoking, No Pets ! WALK-IN LEVEL NO STEPS TO CLIMB! Wireless Internet included in condo, just bring your laptop. Amenities: Wireless High Speed Internet, FREE local and long distance telephone service, telephones, 3-Flat screen cable TV's, 1-DVD & VCR, 3-Ceiling fans, Central Air Conditioning, Fully equipped Kitchen, Refrigerator, Ice Maker, George Foreman type indoor grill, Outdoor Gas Grill, Crock Pot, Microwave, Turkey Roaster, Dishwasher, Bunn coffee pot, Cooking utensils, Washer/Dryer, Iron & Ironing Board, & Pack-N-Play crib. All linens provided (bedsheets, bath towels & kitchen towels), hand soap, dish soap, shampoo, body wash, hairdryers in all bathrooms, laundry detergent, paper towels, toilet paper, coffee filters, plastic trash bags & much more. Inside condo to keep family and kids entertained are: Movies(for all ages), coloring books, crayons, puzzles and some books. Located 8 miles from the famous Branson strip, where you will find all the shopping, food & shows that Branson has to offer. Come to Branson and be our guest in OUR condo! Branson Attractions are Silver Dollar City, White Water Park, Celebration City, ShowBoat Branson Belle Dinner Cruise, Sight & Sound Theatre, Downtown Branson Landing, Table Rock Lake & Dam, Trout fishing at Lake Taneycomo, 12 Golf courses, Miniature golf, over 40 theaters with live shows, dozens of restaurants, Wildlife viewing, Cinemas, IMAX Theatre, Go-carts, Museums, Sightseeing, Swimming, Boating, Sailing, Waterskiing, Parasailing, Snorkeling/Diving, Jet Skiing, Outlet malls, craft malls and other shopping and so much more! My husband and I grew up in Illinois, but we LOVE the Table Rock Lake in Branson, MO. We started going to Branson since we were married in 1988 and we've been going back to vacation as often as we can (usually 2 or 3 times a year). When we had our son, we found Branson to be the perfect place to take him. He has enjoyed Silver Dollar City, the Table Rock Lake and many other things over the years. We had always stayed in motels and then one year, we went to Branson with Dale's parents and stayed at a condo. We LOVED it! So, we had to invest in a condo, to have a place of our own to stay at. We now own 2 condos in Branson, this one at Emerald Bay on Table Rock Lake and also a 3 bedroom condo closer to the Branson strip. We love Branson and hope to retire here someday on Table Rock Lake. We chose Emerald Bay Resort because of the Table Rock Lake and the swimming pool that is close to the condo. Also, the quietness of the area and a walk-in condo really makes it nice. While staying at our condo, you will enjoy parking right in front of the condo building. It is walk-in level with only 2 steps off the parking lot. Just a few feet away is the swimming pool at the end of our building. Also within walking distance is the Table Rock Lake, marina and boat docks. Master bathroom with Jacuzzi tub shower. Guest bathroom has tub/shower. Rental has a view of Table Rock Lake, but is NOT directly on the lake. There are obstacles such as buildings and tree between the rental and the lake. But, the lake is clearly viewable 500 feet from condo. All linens provided-bedsheets, pillows, pillow cases, bath and kitchen towels. Parking right in front of condo. Free WiFi inside condo, just bring your laptop. Full kitchen with refrigerator, range, sink, microwave and dishwasher. VCR movies inside condo for all ages to enjoy. Balcony on the front porch of condo by front door. Shared Pool next to our building. Wireless High Speed Internet, FREE local and long distance telephone service, 3-Flat screen cableTV's, 1-DVD & VCR, 3-Ceiling fans, VCR Movies, Fully equipped Kitchen, Refrigerator, Ice Maker, Range, Microwave, George Foreman type indoor grill, Outdoor gas grill, Crock Pot, Roasting Pan, Dishwasher, Washer/Dryer, Pack-n-Play crib, AM/FM Alarm Clock Radios, Jetted Tub in Master Bath, and outdoor Pool & Kiddie Pool(shared). All linens provided (Bedsheets, bath towels, kitchen towels) hand soap, dish soap, laundry detergent, paper towels, toilet paper, shampoo & body wash, hairdryers in all bathrooms, coffee filters, plastic trash bags and much more. NO PETS and NO SMOKING! Wireless Internet, just bring your laptop. Send your inquiry now and you will get a fast response to all your questions. Nice and clean...close to the water and marine was fantastic! Easy to get into. Marine staff was great with putting the boat in and out of the water. New pool is really nice! With added shuffleboard to enjoy. check-out very clear. We could not get the Wifi to connect. Tried multiple times. But because other condos had family, we could use theirs. An enjoyable stay. We would use this facility again! Nice will definitely stay here again. Like that it’s a short drive from town but not too far. Loved it! Had everything we needed was nice and clean and a pleasant stay. Will definitely stay again. We really enjoyed our stay at this condo - perfect for our needs. The condo was comfortable and met our needs. One comment though - the closing instructions say to wash the towels and put them in the dryer before you leave - that left us having to use paper towels in the morning before we left since the wash cycle takes 30 min or so. Fortunately we did not have an early flight in the morning, if so, that would have been problematic. It was a great condo for our family of 5. I loved the proximity to the pool and the walk in level! Would consider staying there again. Thanks for writing in a review. 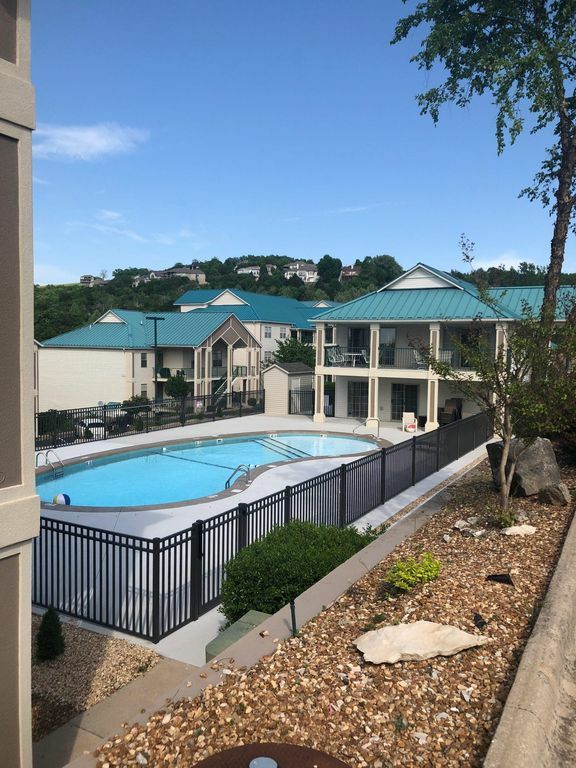 Really nice and clean 2 bedroom, 2 bath condo only 7 miles from downtown Branson! paper towels, napkins, trash bags, shampoo and bodywash. Most condo owners do not supply those things so it was nice that they do. They even have a basket in the kitchen filled with sugar packets, creamers, tea bags, hot cocoa, popcorn. You can literally just bring your clothes and a toothbrush and paste and be all set! My husband and I were very happy with our stay and highly recommend this condo! Thank you for allowing us to stay in your beautiful vacation home! Also if you get a chance, I highly recommend Moonshine Beach for the day. Crystal clear Table Rock Lake. Get there early to get a good spot as it fills up quickly, and bring beach chairs, umbrella and water shoes. Just 10 minutes to Branson attractions, Silver Dollar City, White Water Park, Celebration City, ShowBoat Branson Belle Dinner Cruise, Sight & Sound Theatre, Table Rock Lake & Dam, Trout fishing at Lake Taneycomo, 12 Golf courses, Miniature golf, over 40 theatres with live shows, dozens of restaurants, Wildlife viewing, Cinemas, IMAX Theatre, Go-cars, Museums, Sightseeing, Swimming, Boating, Sailing, Waterskiing, Parasailing, Snorkeling/Diving, Jet Skiing, Outlet malls, craft malls, and other shopping and so much more. Full service marina with available dock rentals. Cancellation Policy- can cancel up to two weeks before your stay. Within two weeks, we keep the deposit Rates are subject to change until confirmed.